K. van Bourgondien 100% Natural Bulb Food (4-4-2) - 3 lbs. Apply Now for Maximum-Size Blooms! This all-natural fertilizer will provide your bulbs with a boost, resulting in bright, beautiful flowers. An annual feeding keeps your flowers in peak shape year after year. Long-acting fertilizer releases important nutrients steadily to the soil, enriching bulbs for spectacular, showy blossoms. Each 3 lb. 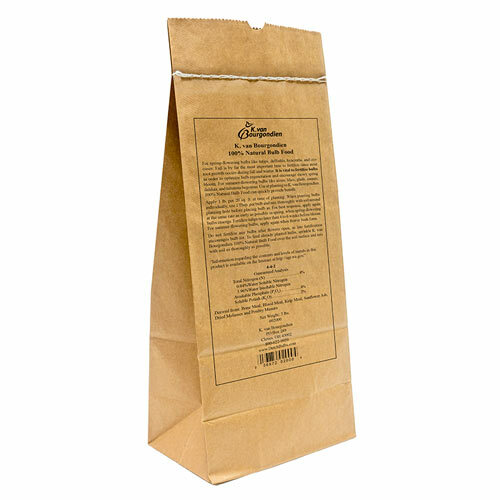 bag feeds 60 sq. ft.
Botanical Name: 100% Natural Bulb Food - (4-4-2) - 3lbs. 100% Natural Bulb Food - (4-4-2) - 3lbs.